Brenno began working with glass hats in college as almost a mistake. He quickly realized the power the hat shape had to evoke strong associations, memories and feelings that everyone could understand. His series of glass hats evolved from an interest in human interaction with familiar objects. 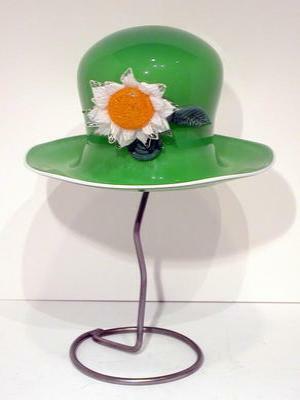 Hats offer Brenno the opportunity to explore the challenges of glass blowing, and the relationship with everyday objects, such as hats, seen in a new light. Brenno was first introduced to glass blowing in 1981 while attending a stained-glass class at Pilchuck Glass School in Washington. He became hooked immediately and has been blowing glass since. He worked for Dale Chihuly on his glass-blowing team for nine years after college. In 1997 he opened his own studio in his grandfather’s old auto repair shop on Vashon Island, Washington.